This past December marked the thirtieth anniversary of the Cascade Blues Association becoming a business and a non-profit organization. There have been a number of changes since the inception, not only in how the company is run and the events that we hold, but definitely in the make-up of the music community itself. 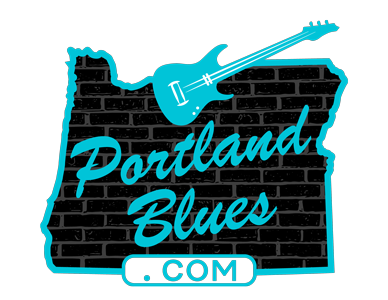 The CBA strives to continue to support the blues scene in Portland and the Northwest despite the coming and going of venues, and laws and personal economics that alter the way we go about attending events as often as many of us might have in the past. The CBA had faced challenges with a drop in membership at the beginning of the year, which we recognize and made a point to correct. I am happy to say that as the year came to an end we saw an increase over the preceding months that have brought us back to the 1000 member levels once again and steadily rising. This took a lot of work on the behalf of our Membership Secretaries Fred and JoAnn Morgan, who tirelessly sent out notices for renewal and requests to expired members from the previous two years asking them to consider coming back. And so many did. Thank you. We still print out the BluesNotes for our members every month, despite many other blues societies turning to online publications only, or cutting back to bi-monthly or quarterly printings. Our members have stated that they want to receive the paper, so we will continue doing so at this time. It is a great expense on us and very time consuming. But we have also gone toward the more modern edge as well with Vice President Wendy Schumer putting together our monthly e-mail blasts with much of the BluesNotes content to our members. So now, no matter how slow the mail may be coming to your homes, you can still get the news delivered to you electronically. One event that we have held the past ten years of so is the Red, White & Blues Dance (formerly the Sweetheart Dance). We have decided that this will not happen this year as we are more interested in holding a Thirtieth Anniversary event instead. We simply do not have the funds in our accounts to hold both and feel that the anniversary celebration is more important this year. We will look at the Red, White & Blues Dance again next year. As for the Thirtieth Anniversary, we are currently looking at what we may be able to afford to present such a celebration of our blues community correctly. Venues are being approached to find one the proper size, dates available and for a cost that we may be able to handle. Sponsorships may be requested to assist, but we will need to work the details out for that yet. Our monthly membership meetings will have an increase in admission for non-members, going from $3.00 to $5.00. This is the first time we have increased the admission since we first began charging for non-members. We still intend on our members having free admission, though many other blues societies charge their members like everybody else. This means your annual dues will save you even more as at this time we do not plan on raising those fees either. It does not seem like a lot, but believe me every small amount counts. An even bigger challenge that we may face is the location for our monthly meetings. The Melody Ballroom has been sold and they’re planning on serious renovations for all levels of the building that may affect some of our upcoming meetings. We are set for January, but the new owners are supposed to contact us to discuss the future changes. We’re hoping that we will continue to be able to hold our meetings here as we have for well over two decades. Cross your fingers everyone! Thanks to Kathleen and the Kaad Family for being so generous to our group for so long. We will miss you and you the very best. But no matter what challenges the CBA may face over time, we will always be 100% in support of our musicians, venues and regional events. We still plan on holding our signature events such as the Journey To Memphis and the Muddy Awards, and we ask for you to help us out when you can. And if we need to find another location temporarily for our meetings we will do so. Please thinks about volunteering for events, special committees that we have, or for the BluesNotes. Or consider becoming a Board Member if you have the time and commitment. We’re always in need of extra assistance and support for our blues community is always appreciated. Let’s look forward to starting off the next thirty years of the Cascade Blues Association as continuing to be one of the best blues organizations and communities possible.